I looked into the eye of a tall white bird last Saturday, and its face reminded me of a monk. I found myself thinking about medieval monasteries, where scribes carefully copied ancient manuscripts, not allowing the knowledge they contained to vanish. My tall white bird with the face of a monk is a Siberian Crane, living at the International Crane Foundation, in Wisconsin. There you can visit all 15 species of planet Earth's cranes and see them up close. 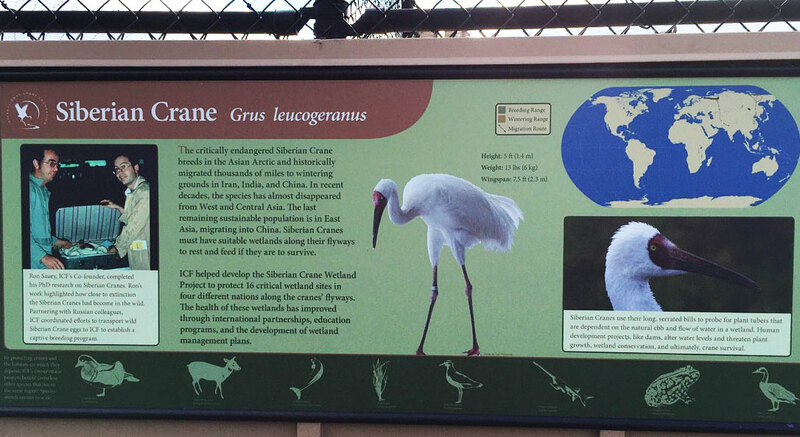 All 15 are impressive, but the Siberian Crane made my heart thump. 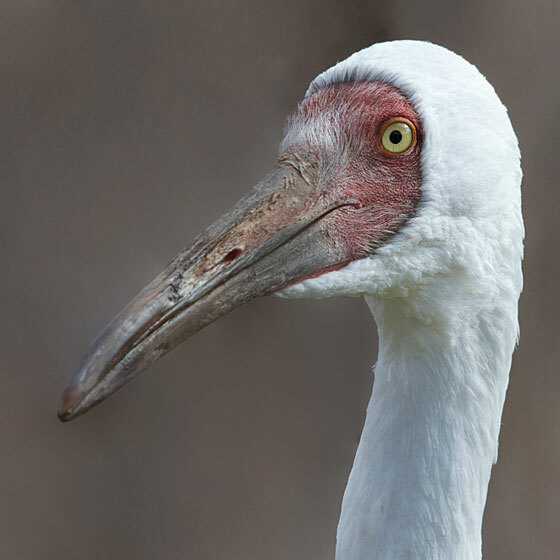 Siberian Cranes depend completely on wetlands, where they dig tubers from the wet soil with their huge bills. 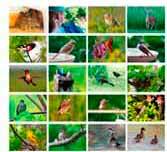 And they are vulnerable both to hunters and to the loss of wetlands to dams and agriculture. The range of the Siberian Crane looks like a few threads dropped on a map of Asia. They breed in Siberia, except for a tiny remnant flock that breeds in Russia's Ural Mountains. The Siberian flock goes south and winters in China, while the Russian group, hanging on to existence, migrates every year to a single spot in Iran. There used to be a third flock that wintered in India, but that entire group vanished in 2002. Only a two-to-three thousand Siberian Cranes still exist, several hundred of them in captivity like the ones I met in Wisconsin. Captive cranes may eventually augment wild flocks, but that alone won't save them. That's going to take much more effort, and we don't know if the cranes will make it through. The International Crane Foundation is part of a worldwide effort to keep all the cranes species with us. The countries that have Siberian Cranes, or had them until recently, do not read like a catalog of places easy to survive in for conspicuous big white birds: Afghanistan, Azerbaijan, China, India, Islamic Republic of Iran, Kazakhstan, Mongolia, Pakistan, Russian Federation, Turkmenistan and Uzbekistan. All of these countries have signed an agreement to try to preserve the Siberian Cranes. Most places, it's now illegal to hunt them, and there are some efforts to preserve wetlands they need for nesting and migratory stopovers. Immediate, pressing human needs often conflict with the interests of the cranes, however. So human problems have to be solved in order to save the cranes. It is a thorny age. But I looked into the eye of a Siberian Crane last Saturday, and I want this bird to make it. To keep its line going, with the hope that the cranes and we will get through this thorny time and emerge into world where everyone can look up and watch wild cranes flying free.